How do I protect my kids from prescription drug abuse? Talk to them, know them, don’t give them access to medications, and change their mindset about these drugs. Kids whose parents talk to them about drugs and alcohol are up to 50% less likely to abuse drugs. That means that simply speaking regularly to your kids about drugs and alcohol is the most important thing you can do to protect them. “Parents need to make time to talk to their kids about the dangers of drugs and alcohol, especially prescription drugs!” (Teresa Willie – Prevention Coordinator for Washington County, WCPC). The more regularly these conversations take place, the better. They don’t need to be a scheduled meeting – when you are riding in your car and you hear an advertisement for a new drug, or when you are watching TV, or when you stop at the pharmacy to pick up some medication – these are excellent moments to discuss the dangers of these drugs with your children. Make sure they understand that these drugs can be very addictive, and they are very dangerous if not taken exactly as the doctor prescribed. You should help them understand that they should never take a drug that was not prescribed to them, and that they should only take it for the injury or illness that it was prescribed for. “It also becomes important for parents to set the example, and not take drugs unnecessarily or abuse them. Parents should only take medications prescribed specifically to them, and only for what they were prescribed for,” (Kelby Tyler, Student – Dixie State College; member of the Washington County Prevention Coalition). With the prominence of these drugs, it is likely that your child will see them (if they haven’t already). Therefore, you may want to rehearse with them how they can decline these drugs if offered them at school or from friends or relatives. Teach them that it is ok to tell their friends that they don’t take any drugs unless a doctor gives them to them. Youth whose parents regularly set clear rules about substance abuse are much less likely to abuse substances. Keep in mind, as Officer Spragg (Washington County Drug Task Force) states, “One of the most important parts of talking to your kids, is listening to your kids. Speak to them openly about drugs and alcohol, and don’t be overbearing with questions or judgment, which may cause them to lie or shut down.” They need to feel comfortable if you want them to open up. Know Them: “Parents have to be close enough to their kids that when they talk about such serious things (as drugs) the kids will hear them,” (Brent McFadden, PharmD, RPh; WCPC). It is important to spend time with them… know them. It can be difficult to identify a person who is high on prescription drugs. If your kids come home drunk, or after having smoked, you will smell it on their clothes, their hair, their skin, and obviously their breath. If they are drunk you may notice slurred speech, slow motor function, and an obvious lack of inhibitions. Prescription drug abuse is much harder to identify. Kids can swallow a pill with a glass of water and continue on with their day, leaving behind no smell or other physical signs of intoxication. Depending on the drug taken their pupils may constrict, or they may dilate, and therefore it can be hard to determine if they are using these drugs or not. So it is very important to know your kids well. If they start changing friends or their behavior changes radically, this may be a sign of abuse. Typical patterns still exist, as with any drug (slurred speech, change in pupil size, fatigue, increased agitation, drowsiness, etc. ), but it is important to know your kids and their behaviors well so that you can identify a change if it occurs. “Parents need to make themselves aware of why their child may be abusing. Typically any type of substance abuse—in the early stages—is a symptom of a deeper issue. A parents approach to that issue can make all the difference,” (Brent McFadden, PharmD, RPh; WCPC). Don’t Give Them Access: You would never leave a syringe filled with heroin in your pantry where your kids could get it, you shouldn’t leave prescription drugs accessible either. Keep in mind that in reality, there is really no difference between many of the narcotics prescribed for pain and heroin, or other illicit narcotics. In fact, when ingested, many of these chemicals break down into the same compound. Don’t leave them where anyone can get them. Your prescription drugs should be locked up! If your children have been prescribed a narcotic, they should not be allowed to self-administer those. You should hand them out yourself, and keep a close eye on them to make sure your child is not taking extra. Over 50% of kids who abuse prescription drugs in the Southwest counties of Utah get them from their own home, or from a friend or family member. “This tells us that we could greatly reduce the accessibility (and therefore, the rate of abuse,) if we would just lock up all prescription drugs and many over the counter drugs, and throw away our extras,” (Teresa Willie – Washington County Prevention Coordinator, WCPC). LOCK UP YOUR MEDICATIONS! Change Their Mindset: Our children are being raised in a society where drugs are a common part of everyday life. If we have a headache, we take a drug. If we are depressed, we take a drug. If we can’t sleep, we take a drug. If we are tired and don’t want to sleep, we take a drug. Why then, should we be surprised when our kids turn to a prescription drug to take away their stress, or their pain, or to feel better, and subsequently find themselves addicted? We constantly hear from kids that they don’t think there is anything wrong with these drugs because they are made and prescribed by doctors. We need to help our kids see that these drugs are very dangerous, and should be treated with great care. Don’t share your prescription drugs with others, or you are reinforcing your child’s belief that if a pill is made by a doctor, it must be ok. For that same reason, you should never use a drug for any reason except that which it was prescribed for. Your children will see, and again, it reinforces that belief that these drugs are not dangerous. 35% of teenagers believe that prescription narcotics are not addictive. We must change this mindset. Our children must learn that these drugs are dangerous and should be treated with care. As a parent should I be concerned about it? And is it being used and sold here in Southern Utah? “Be concerned. Be very concerned,” (Curtis Spragg, Washington County Drug Task Force Agent and Vice Chair of the Washington County Prevention Coalition). Spice is a legal synthetic version of the chemical THC, the main psychoactive constituent of marijuana. As a parent or community member you SHOULD certainly be concerned about this substance because it is being sold and used here in Southern Utah. In fact, Task Force agents have already identified at least 6 locations in Southern Utah that are selling the substance, and youth social workers are reporting that some kids are making and selling it themselves. Recently, Southwest Center Prevention Specialists interviewed one youth who had been selling the substance to friends. He reported that the drug was very popular, and that many of the kids he knew had switched from smoking marijuana to using Spice. While many cities and counties in the nation and Utah are working to ban Spice, and state legislation is underway to make it illegal throughout the state, as of now (November 2010), it is still legal to sell and purchase the drug in many parts of Utah. For this reason, some youth have switched from marijuana because it’s more difficult for them to get in trouble for using Spice. The drug is a synthetic chemical that is sprayed onto vegetable or plant matter and then smoked. Users report a high similar to marijuana, but in some ways more intense, and with more immediate side effects. ER visits as a result of the use of this drug have spiked quite severely in Southern Utah, and reports to social workers, juvenile courts and police have continually been on the increase. One St. George youth therapist said, “Kids are using this drug a lot. All the kids I work with know about it, so parents and community members need to know about it. They need to know that it is here in our communities, and they need to know that the side effects we DO know about are dangerous… things like severe stomach pains, vomiting and diarrhea, and migraine-like headaches. And since this is a new drug, the scariest part is the side-effects we DON’T yet know about. Users should be concerned about the long term effects of using this drug.” (Angela Braaten, Licensed Social Worker and member of the Washington County Prevention Coalition). Local users report that the drug is very addictive and that the side effects are quite severe. One youth admitted to vomiting blood on two separate occasions after having used the substance for about five months. They also report paranoia and extreme anxiety, as well as disturbed and scary nightmares, trouble breathing, and loss of memory. For more information on this drug, please view our Spice Information Page. If you have questions, please feel free to contact Southwest Prevention. Help us share the word about this drug. Invite your friends to read this article, share our factsheet with them, and “like” Southwest Prevention on facebook to get regular updates and information about local trends. Is it safe to give my kids melatonin every night to help them sleep? Quick Answer: Probably not… although, there is not a lot of research on long term effects of the substance. Regardless, most of the professionals we asked agreed that it may not be a good practice, and likely ignores the real issue that is preventing your children from sleeping without supplemental aid. And perhaps more importantly, this practice could have negative, long-range impacts on your children. Certainly it should not be used without oversight and consultation from a physician. This practice does seem to be trending, but it could be both dangerous and negative for your family. What is Melatonin? Melatonin is a hormone that is primarily secreted by the pineal gland in the brain. It helps to regulate other hormones in the body, and it maintains the body’s circadian rhythm, which is an internal 24-hour clock. So when it gets dark, your body produces more melatonin, causing you to feel sleepy. When it’s light outside, the production of melatonin decreases, (Peuhkuri et al. 2012). Melatonin also helps control the timing and release of female reproductive hormones, helping to determine when a woman starts/stops to menstruate; and some researchers also believe that melatonin levels may be related to aging, (Ehrlich 2011). Melatonin has also been shown to effect roles in seasonal adaptation (Arendt 1998) and pubertal development (Waldhauser et al 1991). Melatonin is most commonly sold as a dietary supplement to be taken in pill form for aid in sleeping; (it can also be purchased in capsules, cream and lozenges that dissolve under the tongue). Certainly, researchers and doctors agree that melatonin should only be used under the direction of a medical doctor and/or psychiatrist. Even then researchers Braam et al. (2010) caution doctors against prescribing melatonin if they cannot perform melatonin clearance tests on their patients: “…clinicians who treat patients with melatonin should be aware of the possibility of slow melatonin metabolisation. When it is not possible to perform a melatonin clearance test, it is strongly advised to lower the melatonin dose instead of increasing the melatonin dose,” or stopping use altogether. Dr. Ryan Williams, MD (who is board-certified in both pediatrics and psychiatry,) always recommends consulting a doctor before use, and cautions against use of the substance with young children. "With preschool-aged children I prefer not to use melatonin or other sleep aids except in extreme cases. Even with older children I am much more cautious [using melatonin] and generally recommend it to be used under consultation with a physician. Melatonin may be listed as a supplement and is easily obtained over-the-counter, but it should be considered a medication. It acts as a hormone replacement/supplement. While it is a natural substance, I do not believe there is sufficient research to warrant mass use in pediatric populations, especially preschool populations." Should I give Melatonin to my kids to help them sleep? There are some obvious negative impacts of providing these pills to children as a sleep aid. More importantly, it’s likely that parents are using these pills as a band-aid fix to a problem, rather than addressing the real issue. “If a child isn’t sleeping at night then there is probably an underlying reason that should be addressed, like a medical condition, poor bedtime routine, diet, etc.," (Dan Riding, PharmD). “Sleep is a normal process of life and should not require the use of medication except in exceptional cases. Those with true sleep disorders, (such as sleep apnea,) need to consult a physician for appropriate treatment. Those with mood or anxiety problems as a source of their sleep issues would be best advised to consult a psychiatrist. Most other situations should respond to appropriate sleep hygiene, including firm bedtimes… especially in the pediatric population,” (Dr. Ryan Williams, MD). Modern life has introduced many social and environmental factors into the lives of our children that can impact their sleep cycles quite dramatically. Things like: watching too much television or too much time playing video games, or doing either of those right before bedtime, can hinder the body’s natural production of melatonin and make sleep difficult for children. High amounts of sugar and even small doses of caffeine affect children much more drastically than adults, and can make it difficult for them to go to sleep. See “Things To Consider” below for more details on how to improve sleep hygiene for youth. Finally, consider the social and learning impacts of having our children take a pill every night in order to help them go to sleep. “I’m concerned about what our children are learning when we give them a pill in order to induce sleep more readily. They are learning that a pill will take care of what ails them, rather than the more appropriate lessons taught when we provide good sleep hygiene, (like meditation, schedules, and eliminating sugars, electronics and other stimulants before bedtime,)” (Ben Harris – Vice President, Therapia Addiction Healing Center). “We live in a world where we increasingly search for the quick-fix. We rely far too heavily on medications to fix our problems and provide ease in our lives. As a result, we are facing, for the first time ever, a generation of youth who don’t distinguish between taking a Tylenol for their headache, and abusing prescription narcotics to relieve pressure from their lives. I am concerned to hear that parents are amateur-diagnosing children with sleep disorders, (which are rare among pediatric populations,) and administering a medication/supplement as a solution to the so-called problem. I fear that we are contributing to this socialized norm that suggests to our kids that medications are the answer. It’s almost as if we are falling prey to the same misguided practice that many of our grandparents engaged in when they administered Paregoric, a potent narcotic containing powdered opium, alcohol and morphine, to calm their children. Obviously, a strong narcotic like Paregoric is not the same as a neurohormone like Melatonin, but the principle is. We need to be quicker to explore more positive ways to address issues our children are facing, including sleep behaviors,” (Logan Reid – Licensed Prevention Specialist, Southwest Behavioral Health Center). Discourage television, exercise, computer and telephone use before bedtime. Nearly 50% of American children have televisions in their bedrooms. Many sleep experts advise keeping computers and TV’s out of children’s bedrooms, and turn them off for a significant period before bedtime. In addition to the stimulating effects of these electronics on our brain, the close exposure to bright lights inhibits the bodies natural production of melatonin. Avoid beverages and foods containing caffeine. Does your child have a problem sleeping? Do they also drink soda’s containing caffeine and/or high amounts of sugar? There is an obvious correlation here. In addition to the fact that caffeine is a stimulant, it is also shown to reduce the bodies output of melatonin, (Peuhkuri 2012). “Too often we do nothing to help our bodies produce their own melatonin. Our body is designed to produce the chemical at night when it is time for bed. But when we have all the lights on and are watching TV and engaging in other stimulating activities we hinder this process. When we turn down the lights and do quiet activities, our body starts to manufacture its own melatonin and you sleep easy,” (Melissa Veater – Licensed Prevention Specialist, Southwest Behavioral Health Center). - Dan Riding, PharmD – Veterans Affairs Pharmacy – Member: Washington County Prevention Coalition. - Dr. Ryan Williams, MD – board-certified pediatrician and psychiatrist – Southwest Behavioral Health Center & Turning Point Family Care. - Teresa Willie, LPS – Licensed Prevention Specialist, Southwest Behavioral Health Center. - Ben Harris – Vice President, Therapia Addiction Healing Center. - Melissa Veater, LPS – Licensed Prevention Specialist, Southwest Behavioral Health Center. - Logan Reid, LPS – Licensed Prevention Specialist, Southwest Behavioral Health Center. References/Sources:J. Jarratt (2011). Perioperative Melatonin Use. Anaesthesia Intensive Care Volume 39: 171-181. Department of Anaesthesia, Christchurch Hospital, New Zealand. Arendt J. (1998). Melatonin and the pineal gland: influence on mammalian season and circadian pshyciology. Revies of Reproduction 1998; 3:13-22. Waldhauser F, Boepple PA, Schemper M, Mansfield MJ, Crowley WF. Serum Melatnonin in central precocious puberty is lower than in age-matched prepubertal children. Journal of Clinical Endocrinology & Metabolism 1991; 73:793-796. W. Braam, I. Van Geijlswijk, H. Keijzer, M.G. Smits, R. Didden, L.M.G. Curfs (2010). Loss of response to melatonin treatment is associated with slow melatonin metabolism. Journal of Intellectual Disability Research. Volume 54 Part 6. p. 547-555. Will lowering the legal blood alcohol content (BAC) reduce problems and save lives? Yes. The research is very clear on this. Alcohol regulation in the United States is as old as the United States… actually, older. Way back in the 1600’s the colonies started enacting regulations to control the problems that were occurring with alcohol consumption, (we have a great presentation on the history of regulation if you’re interested). New York was the first state (back in 1907) to enact laws that specifically criminalized driving an automobile while intoxicated, (NJ Criminal Law Handbook, 2016). The first generalized legal intoxication level was established in 1982, when congress encouraged states to enact a .10 Blood Alcohol Content/Concentration (BAC) at the state level. States were offered extra grant incentives if they went lower, to the .08 BAC level. Utah was one of the first to pass a .08 per se law, in 1983. In 2000, President Clinton passed the HR4475 Appropriations Act that penalized any state that didn’t have a .08 BAC policy by cutting their highway safety money by 2% each year the policy wasn’t passed. In 2013, the National Transportation Safety Board (NTSB) recommended that all states should reduce their legal BAC to 0.05% or lower. In truth, the United States is behind the times. More than 100 countries have set drunken-driving levels at 0.05% or lower, including all of Australia, France and Germany and all of Canada (except Quebec). 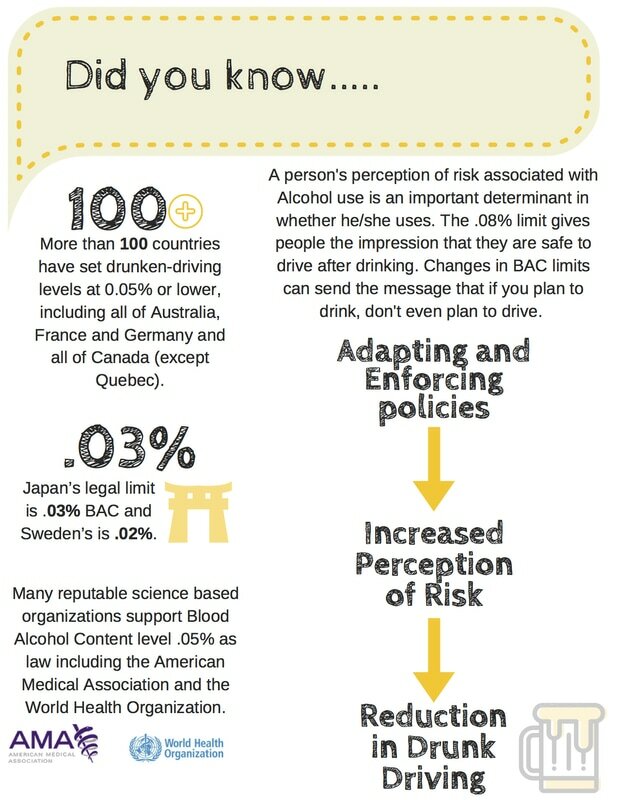 Japan’s legal limit is .03% BAC and Sweden’s is 0.02%. The real question is whether or not lowering the legal BAC will reduce problems and save lives. The research makes it very clear that it has, it does and it will continue to do so, and it’s important that we allow this research to inform our policies, rather than basing them off of culture and politics. 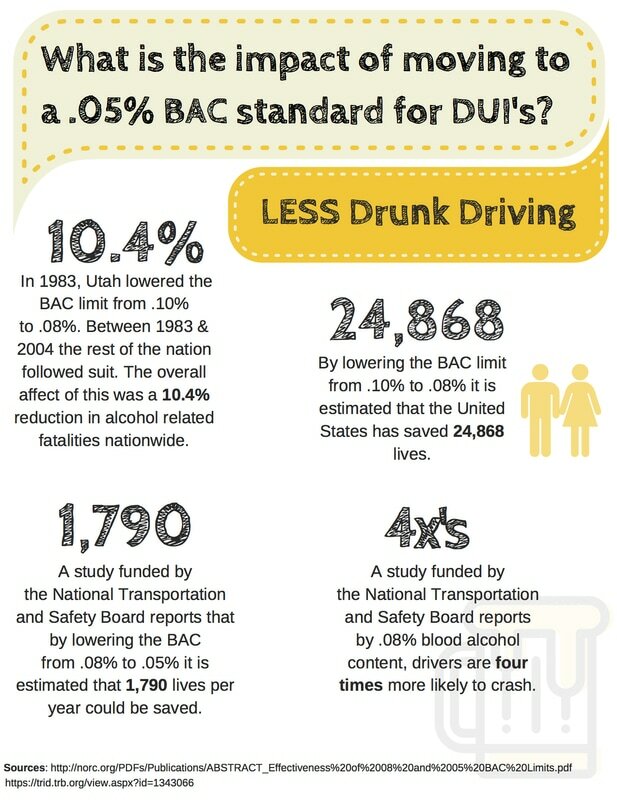 For more information on the proposal to decrease the legal BAC in Utah, visit Representative Thurston's site. Do you have a question you'd like our staff to answer? Just submit it through the anonymous form below. We'll have local professionals respond and we'll post answers to frequently asked questions here for everyone to view. If you'd like a private response, just include an email address and we'll respond.